- Full of fire and rich, deep color, this amethyst teardrop is framed by a charming sterling silver Celtic setting. Pendant measures 1 1/8" tall, including bail. Comes with an 18" sterling chain. 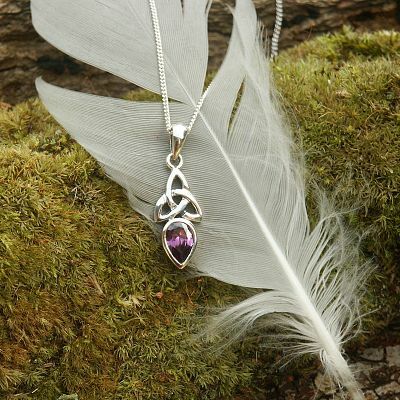 Do you have any other questions about our Silver Amethyst Teardrop Pendant? Am purchasing this for my nine year old great niece. She always loves what I buy her mother from Gryphon and now she'll have her own. Her dark skin will offset the pendant beautifully. Bought this for my wifes' b'day. She loved it! Beautiful stone, nicely polished silver. Note that the chain is very fine... be gentle with it. Well worth the price.